Click on each map to see a bigger version and/or print. LA CROIX DU REH is situated near the centre of the village of Châteauneuf-la-Forêt, about 35km east of the city of Limoges. 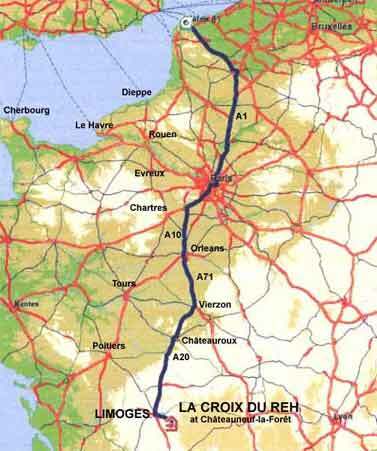 The BLUE LINE on the map shows the most direct route to La Croix du Reh from Calais, travelling via Paris. If you are travelling from England, Paris may be avoided by travelling via Rouen, Evreux and Chartres – joining the A10 autoroute just north of Orleans. After joining the A71 at Orleans, travel south until the autoroute splits at Vierzon and take the A20 to Limoges via Châteauroux. 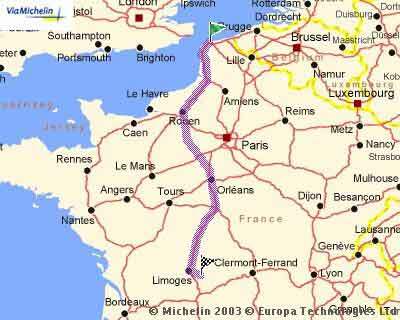 At present this autoroute is free of all toll charges. Leave the A20 at Feytiat, Junction 35, direction Eymoutiers. 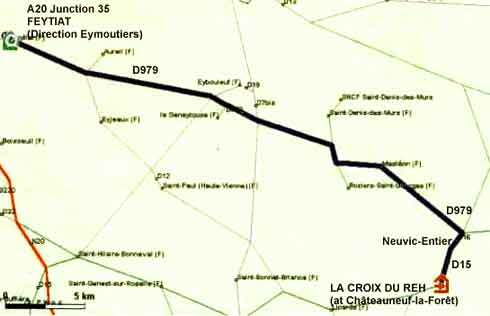 Follow the D979 until shortly after Masléon, turning right to join the D15 at Neuvic-Entier. The D15 leads you into the village of Châteauneuf-la-Forêt and La Croix du Reh will face you at the top of the hill! Follow the signs for Poitiers and the A20. This leads to the Limoges northern by-pass. Ignore the next turn-off for Poitiers at this stage. Follow the road to the A20 (junction 28) and join the autoroute heading south signposted Limoges and Toulouse. From the A20 autoroute, take Junction 35, signposted Feytiat and Eymoutiers. Follow the D979 towards Eymoutiers. After 24 kilometres, Chateauneuf-la-Foret and Neuvic Entier are signposted to the right. In Neuvic turn right and follow the roads down the hill and across the river bridge (River Combade). Stay on the main road, signposted Sussac and the A20. At the top of the hill, with the College buildings on the right, you will see La Croix du Reh right in front of you. It is the building with the black and white shutters. Parking is usually available through the white gates to the left of the building. From the A20 autoroute, take Junction 35, signposted Feytiat and Eymoutiers. Follow the D979 towards Eymoutiers. After 24 kilometres, Chateauneuf-la-Foret and Neuvic Entier are signposted to the right. In Neuvic turn right and follow the road down the hill and across the river bridge (River Combade). Stay on the main road, signposted Sussac and the A20. At the top of the hill, with the College buildings on the right, you will see La Croix du Reh right in front of you. It is the building with the black and white shutters. Parking is usually available through the white gates to the left of the building. From Bordeaux airport follow towards Perigueux , then take N21 towards Limoges and follow all the way up to the Autoroute A20. Join Autoroute A20 at the Junction 33 and go South towards Toulouse. Exit A20 at the Junction 35, signposted Feytiat and Eymoutiers. Follow the D979 towards Eymoutiers. After 24 kilometres, Chateauneuf-la-Foret and Neuvic Entier are signposted to the right. In Neuvic turn right and follow the roads down the hill and across the river bridge (River Combade). Stay on the main road, signposted Sussac and the A20. At the top of the hill, with the College buildings on the right, you will see La Croix du Reh right in front of you. It is the building with the black and white shutters. Parking is usually available through the white gates to the left of the building. From the A20 autoroute, take Junction 42, signposted St-Germain-les-Belles. Follow the signs for Chateauneuf. As you come into the village, past the lake on the left and the Super U market on the right, follow the main road. After the Credit Agricole Bank on the right, La Croix du Reh is 100 metres further on, opposite the College.